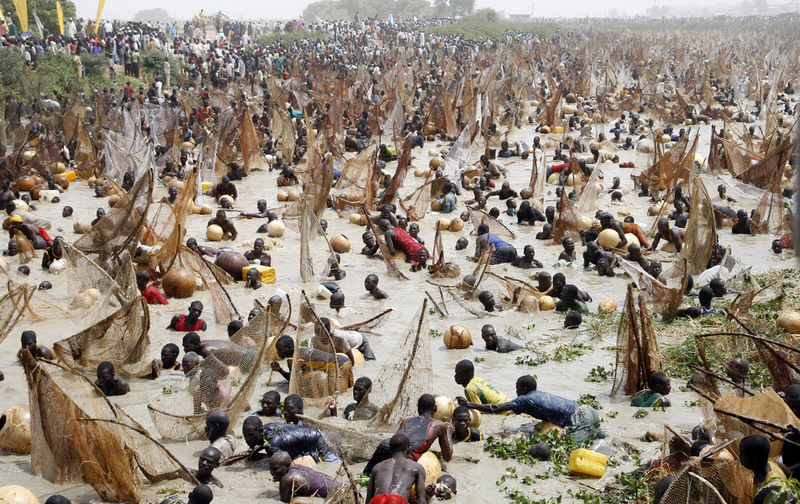 The Argungu Fishing Festival is an annual four day festival in north-western Nigerian state of Kebbi. The 2008 Argungu Fishing Festival was planned for March 12-15. The festival began in the year 1934, as a mark of the end of the centuries old hostility between the Sokoto Caliphate and the Kebbi Kingdom. In 2005, the winning fish weighed 75 kg, and needed four men to hoist it onto the scales. In 2006 the festival banned fishing due to safety concerns relating to the low water levels. The importance of the festival to the economy has led the government to conserve fish stock by prohibiting use of gill nets and cast nets. The Zauro polder project, an irrigation scheme in the Rima River floodplain to the south of Argungu, has been criticized because the reservoir threatens to flood the traditional site of the festival. On the final day of the festival, a competition is held in which thousands of men and women line up along the river and at the sound of a gun shot, all of them jump into the river and have an hour to catch the largest fish. The winner can take home as much as 7,500 US dollars. Competitors are only allowed to use traditional fishing tools and many prefer to catch fish entirely by hand (a practice also popular elsewhere and known as "noodling" in the United States) to demonstrate their prowess. This colorful annual festival takes place in Arugungu,("ar-GOON-goo"), a riverside town in Kebbi State, Arugungu Festivalabout 64 miles from Sokoto. The leading tourist attraction in the area, the festival originated in Aug. 1934, when the late Sultan Dan Mu’azu made an historic visit. In tribute, a grand fishing festival was organized. Since then, it’s become a celebrated yearly event held between Feb. and March. During the festival, hundreds of local men and boys enter the water, armed with large fishnet scoops. They are joined by canoes filled with drummers, plus men rattling huge seed-filled gourds to drive the fish to shallow waters. Vast nets are cast and a wealth of fish are harvested, from giant Nile Perch to the peculiar Balloon Fish. Furthermore there’s canoe racing, wild duck hunting, bare-handed fishing, diving competitions and naturally, swimming. Afterwards, there is drinking, singing and dancing into the night.